Social media ranking site Klout may soon be under the control of Lithium Technologies according to a new report by Re/code. The deal is reportedly going to amount to at least $100 million in the form of cash and shares. Lithium already deals in the realm of social-media from a customer-service and business perspective, so Klout’s analysis of brands and people may be beneficial to Lithium’s services. Both companies have independently raised millions from investors but it has yet to be seen what type of returns Klout’s investors will see if the deal goes through. 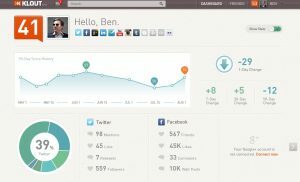 Klout’s founder Joe Fernandez created the service as a way for people to determine the authority that an individual or business has by assigning influence scores. While some individuals do mention their Klout score as a way to show that they have a worthwhile following on sites like Facebook and Twitter, the service is not as popular as some early investors expected it to be. Even with a lack of public attention and popularity, the service that Klout provides can be valuable particularly if paired with another social-media service like Lithium’s. Fernandez had been forced to fight back against criticism in recent years as many people began to view Klout as little more than a popularity contest. Much of the controversy started when Justin Bieber ended up with a higher influence score than President Barack Obama. It is understandable that from a purely social networking perspective, Bieber has a greater reach, but it proved that there is a lot more that goes into determining a person’s influence than the figures Klout was looking at. Going into 2014, Fernandez was optimistic, which makes sense if he is about to sell the service for nine figures. Summary: Klout is reportedly going to be sold for $100m to Lithium Technologies. The deal is nearing completion but has yet to be finalized.